Founded in 1974, Demirer Holding is one of the pioneers in the development of the renewable and sustainable energy market in Turkey. The establishment of the first wind farm in the city of Cesme, Izmir province, is owed to the company that successfully operates its 1.5 MW nominal power since the 1998. As a leading player in the wind energy sector, Demirer Holding is currently monitoring more than 400 MW under Energy Studio Pro® in 17 wind farms across the country. The company will continue to invest in clean energy in Turkey by adding 250 MW by the end of 2018. For Demirer Holding, the monitoring of all wind farms simultaneously and in one single platform along with the difficulty in elaborating the data provided from the SCADA System in easy reports were the main challenges to address. Our previous solution could not help us anymore since it did not longer meet our needs explains Mr. Burak Derinpinar, Responsible Engineer of the All Wind Park Projects & Operations, adding that the possibility to remotely control the wind turbines performance everywhere and anytime is of high priority for the company. That is where Energy Studio Pro® became a valuable team member. Our team is constantly working on the field, therefore we needed a windfarm management software supporting technicians on-site and allowing us to monitor the operations directly from our office remembers Burak Derinpinar who remarks Getting an independent turn-key solution to supervise the power plants in a transparent and user-friendly way was the main reason to choose Energy Studio Pro®. 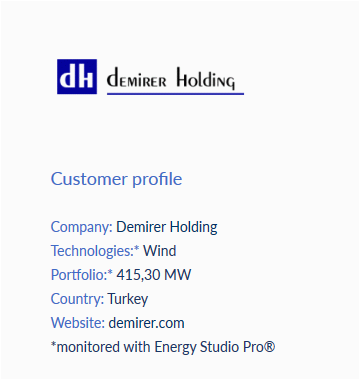 Since February 2012, Demirer Holding benefits of the multiple advantages of Energy Studio Pro® by monitoring more than 400 MW of wind power. Among other things, Energy Studio Pro® allows us to be instantaneously notified of any fault, even via mobile phones. Now, we can see real-time data, restart and reset our turbines and thus saving valuable time says Burak Derinpinar who points out: Before utilizing Energy Studio Pro®, we spent more time checking all wind farms one by one, as well as downloading and analyzing data manually.Today, Demirer Holding is able to access production data, reports and KPI calculations directly through web-based visualization, having the possibility to remotely control even via smartphones and tablet devices. With Energy Studio Pro®, Demirer Holding has achieved complete visibility through a unique independent platform acting as a central data hub for all its power plants. In the very next future, we want to move forward to a more integrated process for O&M activities says Burak Derinpinar who also emphasizes the successful partnership with BaxEnergy: We can easily reach out to our dedicated support team by e-mail or by phone.